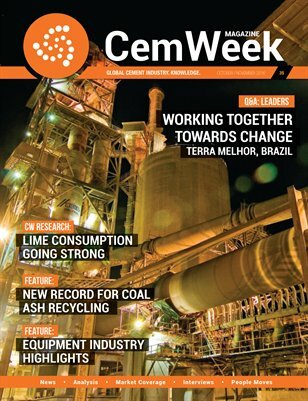 The latest issue of CemWeek Magazine is online! Q&A Leaders: Working together towards change We discussed sustainability and environmental issues in the Brazilian cement sector, with experts from Terra Melhor. Read the second part of an exclusive interview. Lime consumption going strong CW Research’s outlook for the global for quicklime, slaked lime and hydraulic lime markets, through 2021. Cement equipment industry and its latest offerings The equipment industry benefited from expansion, optimization or even maintenance plans and strategies, signing important contracts with cement companies in the last months. New record for coal ash recycling More than half of the coal ash produced in the United States in 2015 was recycled, for the first time breaking through a 50 percent utilization level.